Badewanne Team receives funding for research of ghost nets and harmful substances in wrecks – both in Finland and Sweden! First part of these good news came on Thursday 16th of February, when we received funding of 10.000€ from Ålandsbanken Baltic Sea Project for mapping and data collection of ghost nets and harmful substances in Gulf of Finland. This funding enables us to carry on this environmental research in addition to our historic wreck research in coming years. The end result of this work will be a database containing complete information packages of wrecks containing ghost netting (a.k.a. 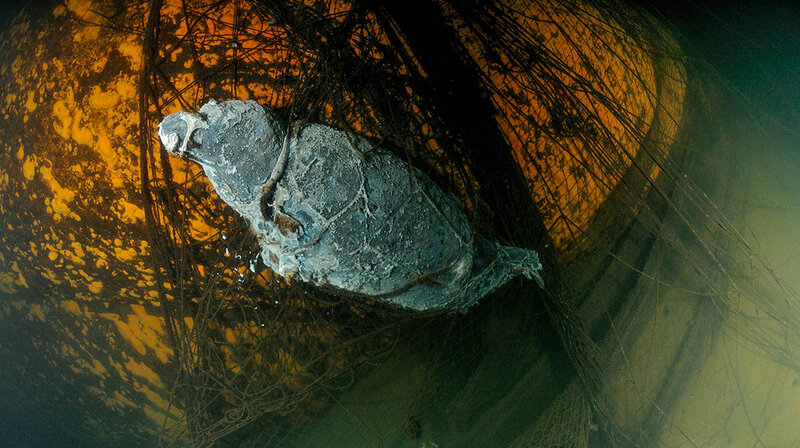 derelict fishing gear, DFG) as well as harmful substances such as oils. This information will then be made available to scientists and authorities responsible for environmental problems associated with wrecks. This material can be used to assess the possible environmental threats, and in planning of countermeasures to contain these threats. The second bit of very good news we received on Friday 17th March when visiting Naturkompaniet headquarters in Stockholm during the annual Stockholm dive fair DykMässan. We received 300.000SEK from Naturbonus project for removal of nets from a freighter sunk in 1942 outside of Oxelösund on Swedish Baltic Sea coast. This process will be carefully documented, and hopefully will serve, in addition to preventing the netting from killing further seals and fish, also as a template of how to undertake the actual net removal. We are looking forward to co-operate with our friends from Ghostfishing.org who have undertaken such enterprises before in the North Sea. We are very grateful to both Ålandsbanken Baltic Sea Project and Naturkompaniet Naturbonus Project for the funding we received. Both these projects display an innovative and fearless attitude towards new kinds of ways and attempts to remedy the environmental status of the Baltic Sea. We will strive to fulfill our promises and thus honor the trust placed in us by these significant Projects. Copyright © 2019 Badewanne.fi. All Rights Reserved.